Hello! I know, I know, it's been nearly two months since I last blogged. TWO MONTHS HOW RUBBISH. This year I'm determined to post regularly, starting from today. So what better way to start off 2016 than with a hair tutorial (woohoo!) and it's a braid - surprise, surprise. 1. Start by making a section at the top of your head, and tie it into a small pony tail. 2. Clip the ponytail you just made out the way so you can grab another section just below this. 3. Now create a new ponytail just under your first one. Unclip the top pony and you're ready to go! 4. Split your first section into two. Just like picture 4. 5. Grab your clip and clip up the lower pony tail in between the two sections you just made. 6. Next, grab the two sections over this and tie with a clear or hair coloured elastic. 7. It should look something like this. 8. 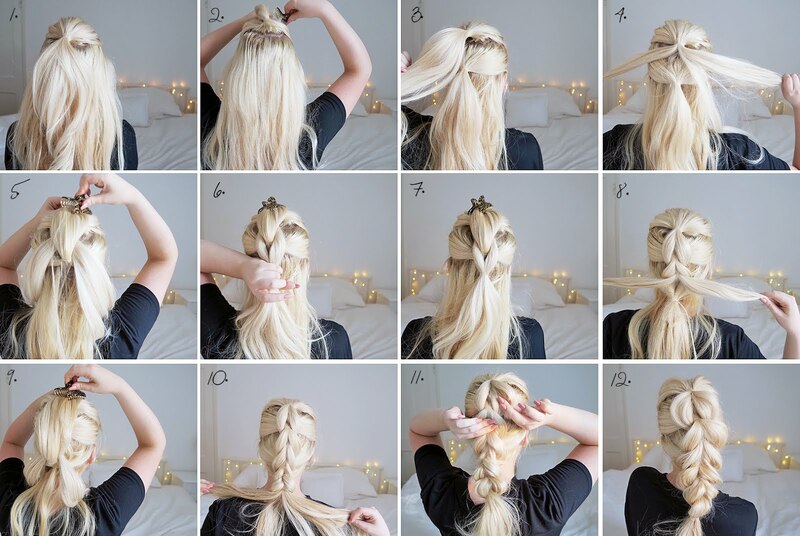 Now continue going down your hair, repeating steps 3-7. Collect more hair from the sides as you do. 9. Always remember to clip the solid ponytail up in between the split ponytail. 10. Continue down as far as you fancy, then secure the whole plait with an hair elastic. 11. Here's my favourite bit, slowly pull out the plait as much as you want, the bigger the better! 12. You should now be done! This looks complex (but it's easy once you have it) and I hope my instructions were clear. Hope you all had a fab holiday and i'm looking forward to 2016 with you guys! GRACE this is so bloody beautiful. The one thing I'm so jealous of is blonde hair, hairstyles like these look so much better than on my boring black hair! You have to come and style my hair every day okay. Great tutorial. Can't wait for my hair to grow a bit longer so I can try this out :).